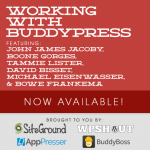 Building communities on BuddyPress is something Bowe is very passionate about. He has spoken about building communities using BuddyPress on WordCamps all over the world. As one of the lead developers of the Commons in a Box project, Bowe focuses on helping universities and non-profits create social spaces for their (academic) communities. These projects combine the things he’s most passionate about: theme development, community building and consulting.